Canada Cobalt Works Inc. (TSXV:CCW) (OTC pink: CCWOF) (Frankfurt: 4T9B) is focused on its past producing cobalt-silver Castle mine in the Northern Ontario Cobalt Camp, Canada’s most prolific cobalt district. With underground access at Castle, a recently installed pilot plant to produce cobalt-rich gravity concentrates on site, and a proprietary hydrometallurgical process known as Re-2OX for the creation of technical grade cobalt sulphate as well as nickel-manganese-cobalt (NMC) formulations, Canada Cobalt is strategically positioned to become a vertically integrated North American leader in cobalt extraction and recovery. Canada Cobalt is the first in the Camp to produce cobalt sulphate for electric car batteries and also is more advanced than other companies in the process of bringing a former cobalt-silver mine in the Camp back into production. 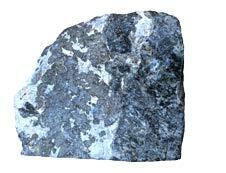 Recent underground drilling at Castle discovered an exceptionally high-grade silver-cobalt vein structure. Also, channel sampling and subsequent drilling in 2018 identified a new, previously unexplored mineralized zone 1.5 km east of the mine adit/shafts that is currently being further explored for an apparent gold system with potentially a cobalt-silver vein networks underneath. In the redevelopment process, Canada Cobalt Works is more advanced than others in the Greater Cobalt Camp, especially due to its proprietary cobalt processing technology and access to underground workings via an adit. No other company has permitted underground access via an adit at this time in the Cobalt Camp. Canada Cobalt Works is led by President and CEO Frank Basa who has over 28 years of global experience in mining and development as a professional hydro-metallurgical engineer with expertise in milling, gravity concentration, flotation, leaching and refining of silver, cobalt, gold and other metals. Management has begun permitting work with the aim of constructing a state-of-the-art 600-t/d gravity flotation cyanidation mill at Castle. Canada Cobalt Works’ portfolio also includes the Beaver and Violet silver-cobalt projects, both past-producers in the Cobalt Camp. 100-percent ownership of 3 formerly producing properties including the Castle Mine near Gowganda and the Beaver and Violet silver-cobalt mines near Cobalt. The company’s main goal is to resume underground mining at these properties using modern mining techniques. Silver and cobalt are essential metals in renewable energy technology. Cobalt is used in 3 of the 4 main types of lithium-ion electric car batteries, and silver is used in 90-percent of crystalline silicon photovoltaic cells in solar panels. Preliminary metallurgical testing in 2017 returned excellent silver and cobalt recoveries and concentrate grades and subsequent testing confirmed it. Exceptional discoveries at Castle since 2011 from sampling and drilling, intersecting up to 188.8 oz/tonne silver (6,476 g/t Ag) and 4.68% cobalt along with nickel and gold. Channel sampling in 2014 exposed significant gold and copper mineralization and led to discovery of Castle Golden Corridor Zone. Subsequent geophysical and geochemical program at Canada Cobalt Works property has identified numerous high-potential drill targets, including a 2018 discovery 1.5 east of the adit and mine shafts which is being further explored for gold mineralization with the potential also of a cobalt-silver zone underneath. Proprietary Re-2OX process achieves 99 percent cobalt recovery. Tight Share Structure; 10 percent held by President and CEO Frank Basa and family members. By completing this form, you are giving consent to receive communication from Canada Cobalt Works using the contact information you provide. And remember you can unsubscribe at any time. The Castle Mine Project includes the former silver and cobalt mine which produced 300,000 pounds of cobalt and 9.5 million ounces of silver. Historic underground ore grade averaged 25 oz/t silver (777 g/t Ag) during production years 1923 to 1930 and 26 oz/t silver (808 g/t Ag) between 1979 and 1989. The Castle Mine’s previous owner, Agnico Eagle, ceased production in 1989 only because of low silver prices (in the range of US$6/oz). Cobalt was not a factor at the time. The veins in the Cobalt Camp are primarily cobalt veins with varying amounts of silver. Mining in the past focused on the veins with high-grade silver, while low-grade silver veins were ignored even if they had high-grade cobalt. Therefore, the area today has large amounts of cobalt and silver remaining and the opportunity for profitable mining has greatly improved with the increased demand and pricing for cobalt, as well as the significantly higher price for silver. The 28 square-kilometer property is located in the historic Gowganda mining camp—responsible for more than 50 million ounces of high-grade silver production in the 1900s — and 85 kilometers northwest of Cobalt, in Ontario, Canada. Two geological trends have been identified on the property including a north-south trending Nipissing diabase intrusive which is the typical host rock for silver-cobalt-nickel deposits in the area; and the potential gold trend along the east-west trending Bloom Lake Fault. Infrastructure includes year-round access roads, water, diesel power, three shafts and an adit. Despite the past-production at Castle, the property remains largely under explored and is highly prospective for hosting a significant high-grade underground cobalt and silver deposit. Drill hole intercepts from the 2011 winter drill program at Castle returned significant assays including drill hole CA-11-08 which intersected 188.8 oz/t silver (6,476 g/t Ag) over 3.09 meters. A 2017 drill program intersected mineralization in each hole and recent bulk sampling from Level 1 of the underground mine showing various high-grades of as much as 3.1% cobalt. 2018 results (reported above) also showed high cobalt and silver grades as well as nickel and gold. Canada Cobalt Works recently announced that it has producedcobalt sulphate in lab tests and is working on other products for potential customers using a unique 100 percent-owned hydrometallurgical process called “Re-2OX”. Designed for high recoveries of multiple metals and elements from all feeds with varying chemistries, Re-2OX was developed by CEO Frank Basa in conjunction with the National Research Council, which is Canada’s premier scientific research organization. Canada Cobalt Works has been carrying out advanced‐stage testing using the Re-2OX process at the SGS Lakefield, Ontario laboratory to evaluate the amenability of the process for efficient recycling of spent lithium‐ion batteries. The Re‐2OX process has taken on fresh importance in light of the increasing demand for cobalt and compelling opportunities in the battery and renewable energy sectors. In addition, in May 2018, Canada Cobalt Works announced that the Re-2OX process had successfully recovered 99 percent cobalt and 81 percent nickel from a composite of gravity concentrates. The process was also successful in removing 99 percent of arsenic, which puts Canada Cobalt in a favoured position since electric battery customers want arsenic to be at very low levels in cobalt products. 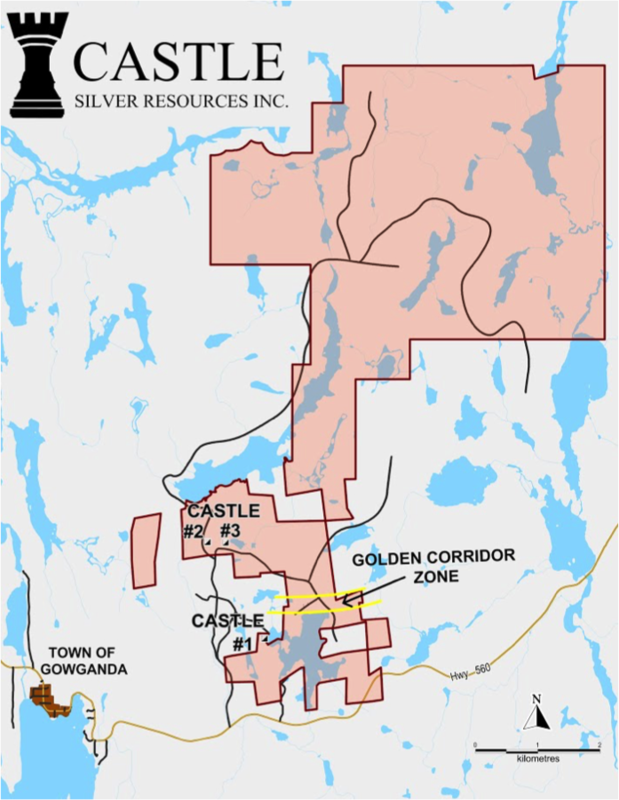 A previously discovered 800-meter Castle Golden Corridor zone is located about 1.7 kilometers northwest of the Castle # 3 shaft and in a geological setting similar to that of the past-producing Kirkland Lake deposit (40 million ounces of gold) located 75 kilometers to the northeast. The zone is highly prospective for a high-grade hydrothermal related gold system with copper to a depth of 300 meters. Channel sampling work conducted in 2014 resulted in a sampling grade of 2.24 g/t gold over 2.2 meters and copper values as high as 1.03 percent. In June 2016, the company signed a 50/50 joint venture agreement with Granada Gold Mine Inc. to advance the zone. In line with the company’s goal of resuming the mining of high-grade cobalt and silver at the properties, near-term plans include additional drilling and bulk sampling underground at the Castle Mine to test for cobalt and other metals in various vein structures. Many of the vein structures are already known to management which has historical data on past drilling and mining at Castle. However, past mine operators only tested for silver, as mining high-grade silver was their focus. In addition, the company has significant discovery potential elsewhere on the property. In 2017, the company completed an induced polarization (IP) survey involving a total of eight 1.8-kilometer lines over a wide area including the Golden Corridor to identify IP anomalies typical of gold and silver mineralization. 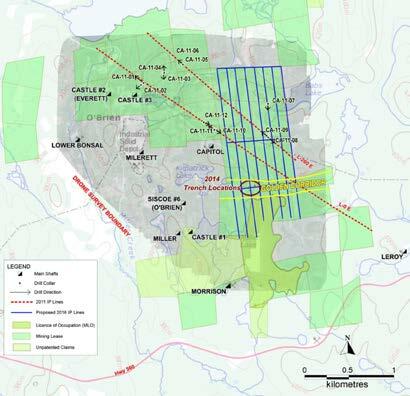 The IP survey (blue grid in accompanying map) identified numerous high-potential drill targets far away from the previously mined areas and known veins and was instrumental in the 2018 discovery of a potential gold mineralization zone 1.5 km east of the adit and mine shafts. Canada Cobalt Works is the only company in the Cobalt Camp to have fully permitted underground access via an adit – which allows easy entry for extracting bulk samples and exploratory drilling to target new discoveries and to start mining sooner than others. Drilling from underground can be less costly and provides greater probability of success, especially since Canada Cobalt Works has mapped previously discovered veins using its extensive data on all past drilling and mine workings at the Castle site from the early 1900s. The Beaver silver-cobalt project is located in Ontario’s historic Cobalt mining camp, adjacent to the former Timiskaming silver mine and approximately 80 kilometers southeast of the past-producing Castle mine. The project itself includes a former producer, the Beaver mine, which produced 7.1 million ounces of silver and 139,472 pounds of cobalt from 1907 to 1940. High-grade mineralization has been repeatedly confirmed at Beaver. In 2017, a selected hand-cobbed sample of material at surface averaged 4.68% cobalt, 46.9 g/t silver, 3.09% nickel, and 0.08 g/t gold. This follows sampling of historical waste rock and tailings at Beaver in 2013 that returned 7.98 percent cobalt, 3.98 percent nickel, and 1,246 g/t silver. 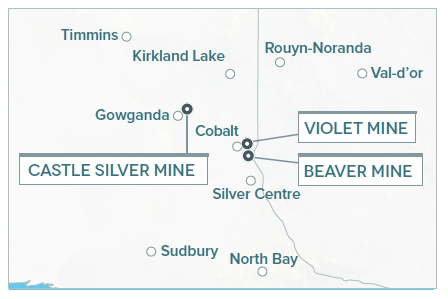 Canada Cobalt Works also holds the formerly producing Violet silver-cobalt mine located near the Beaver property in the Cobalt mining camp. Frank Basa has over 28 years’ global experience in mining and development as a professional hydro-metallurgical engineer with expertise in milling, gravity concentration, flotation, leaching and refining of silver, cobalt, gold and other metals. He is a member of the Professional Engineers of Ontario and a graduate of McGill University. Basa has been the Chairman, Chief Executive Officer and President of Granada Gold Mine Inc. since June 18, 2004. Thomas Devlin brings to the company over 40 years of accounting and management experience in the investment and junior resource industries. Devlin has been Chief Financial Officer of Granada Gold Mine Inc. since July 3, 2009. Dianne Tookenay holds a Certificate in Mining Law from the Osgoode Hall Law School, York University, a Joint Masters of Public Administration from the University of Manitoba, a Bachelor of Administration from Lakehead University and Native Band Management and Indian Economic Development Diplomas from Confederation College Applied Arts and Technology. Tookenay’s experience, knowledge and deep roots within the First Nation communities will continue to add significant value to Canada Cobalt Works’ development efforts over the coming years. Jacques Monette is a career miner who has been engaged in every facet of underground mining for more than 40 years. His previous positions included Shaft Project Coordinator with Cementation Canada Inc., Vice President of Operations/Mining Division for Wabi Development Corp., Vice President of Development for CMAC Mining Group, Operations Manager for Moran Mining and Tunneling, as well as Area Manager for J.S. Redpath Group. Robert Setter is the former Senior Financial Editor for Report on Mining. He brings an extensive business, marketing and analysis background to the company, is a graduate of UBC and holds a BA in Economics. Setter serves as Corporate Research and Analytics for Granada Gold Mine Inc. since 2012. Annemette Jorgensen brings over two decades of public company corporate development, finance, media, and public relations and investor relations expertise. Jorgensen has served on the board of Granada Gold Mine Inc. since April, 2012. As Manager of Debentures Investments with Samoth Capital Corporation, Jorgensen was responsible for raising over one million dollars per month. *Disclaimer: The profile provides information which was sourced and approved by Canada Cobalt Works in order to help investors learn more about the company. Canada Cobalt Works is a client of the Investing News Network (INN). The company’s campaign fees pay for INN to create and update this profile page, to which links are placed on Investingnews.com and channel newsletters.